After completing the Linen Chevron Cowl, I was finally able to start a new project with The Louisa Harding yarn I bought while I was in Vienna, VA several months ago. 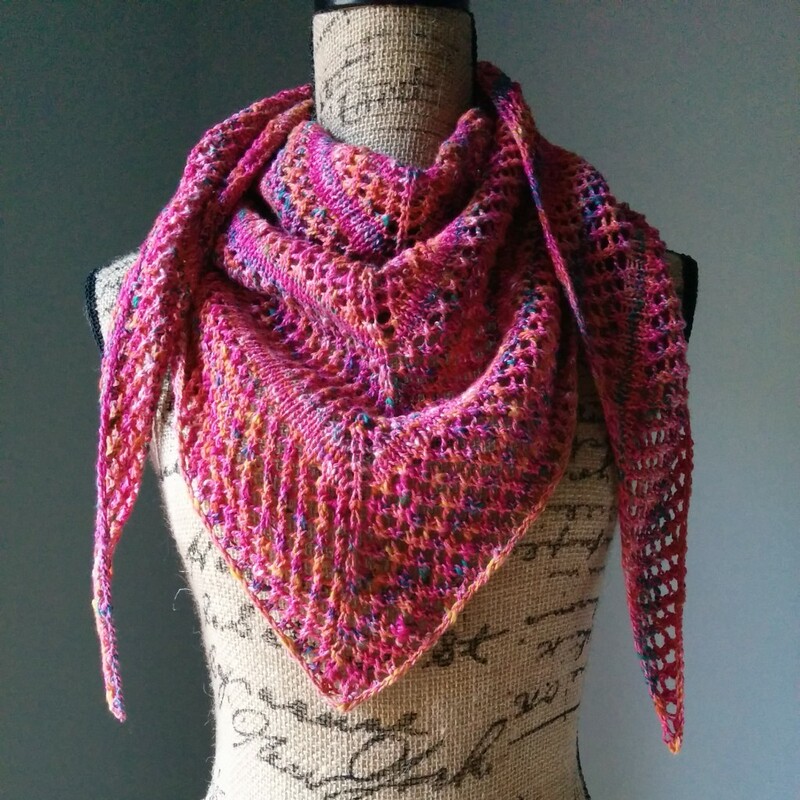 With this fun yarn, I knitted a lace shawl that I could wear on a casual day out. The Casual Lace Knit Shawl is a simple and straightforward project that is perfect for those who have never knitted a shawl before. It uses a little over three skeins of Louisa Harding Noema Yarn which is more than I expected. But overall, I am very pleased with the result. 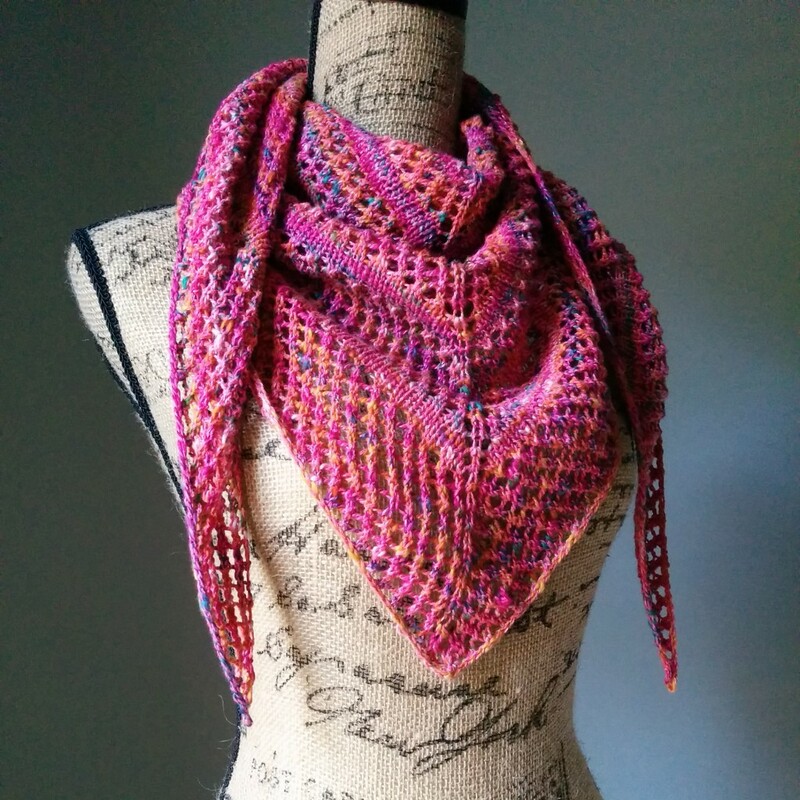 The next time I knit this shawl, I think I will knit it in a gray or blue color. If I do, I will keep you all posted. Anyway, here is the pattern. Enjoy! 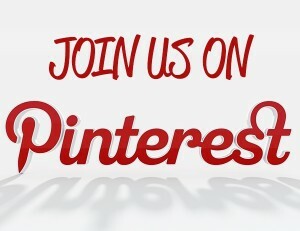 For more knitting abbreviations, please visit the Knitting Abbreviations page. Row 5: k1, yo, knit to stitch marker, yo, sm, k1, yo, knit to last st, yo, k1. Rows 7-50: rep Rows 5-6. Row 51: k1, yo, *k2tog, yo; rep from * to one st before stitch marker, k1, yo, sm, (k1, yo)x2, **k2tog, yo; rep from ** to last st, k1. Row 53: (k1, yo)x2, *(k2tog, yo); rep from * to stitch marker, sm, (k1, yo)x2, **(k2tog, yo); rep from ** to last st, k1. Rows 55-56: rep Rows 53-54. Rows 57-62: rep Rows 5-6. Rows 63-64: rep Rows 51-52. Rows 65-72: rep Rows 53-54. Rows 73-78: rep Rows 5-6. Rows 79-80: rep Rows 51-52. Rows 81-92: rep Rows 53-54. Rows 93-98: rep Rows 5-6. Rows 99-100: rep Rows 51-52. Rows 101-116: rep Rows 53-54. Rows 117-122: rep Rows 5-6. Rows 123-124: rep Rows 51-52. Rows 125-142: rep Rows 53-54. Bind off and weave in all loose ends. Wet block and for stubborn curled edges, additional light steam blocking is recommended. 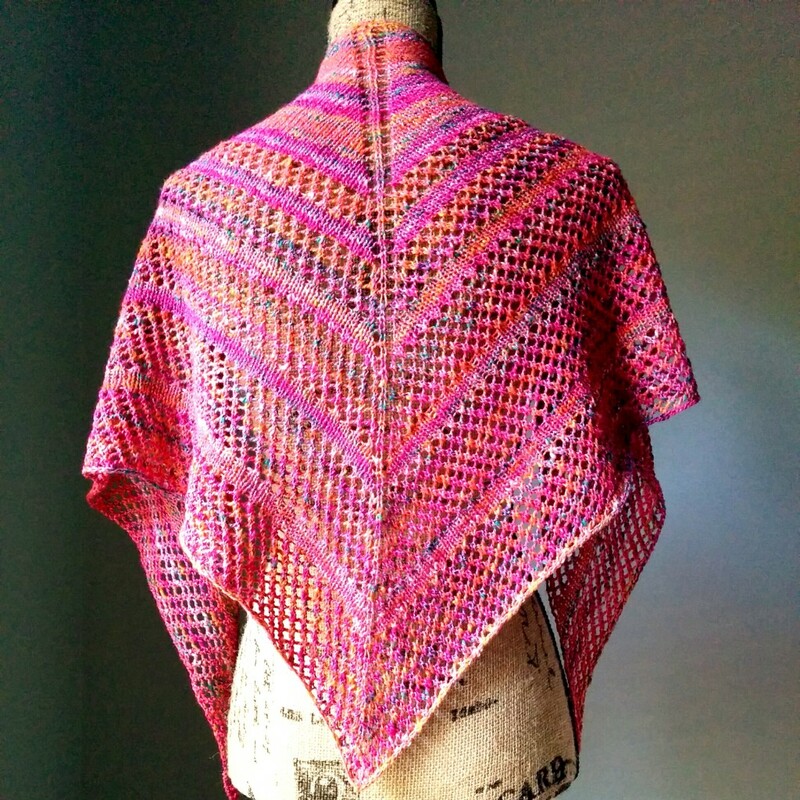 There you go–a new shawl! This is just lovely so I’m going to have a go at knitting this shawl thank you for putting this up for people like me who likes to knit . I plan to do this in a white yarn for my granddaughters wedding. I am using light grey alpaca, hope to finish it soon. Thanks for the pattern. love knitting shawls, going to make this will make an ideal present. thank you. It looks beautiful . 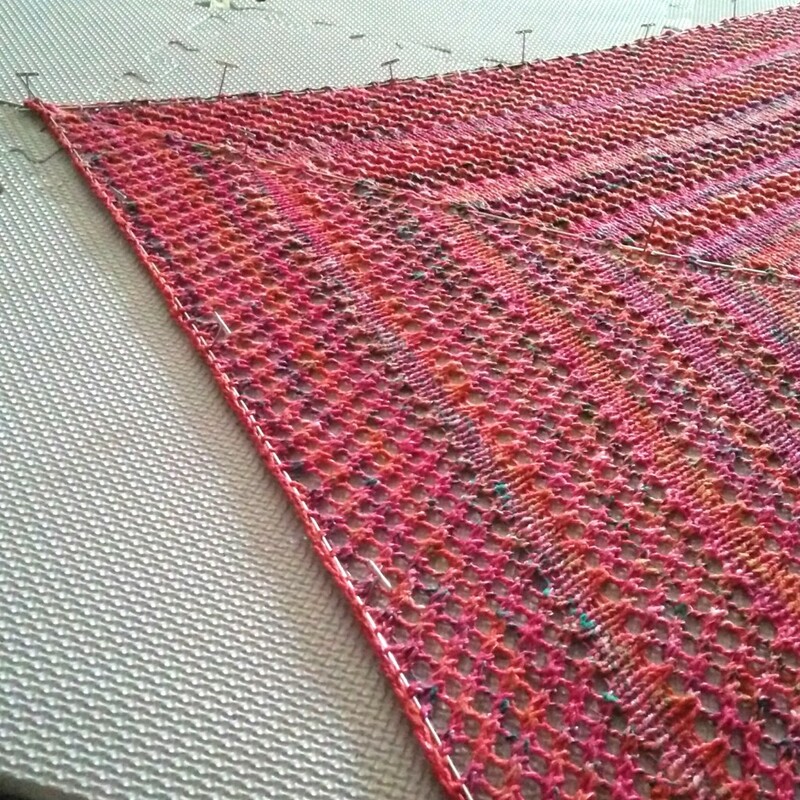 at this point I don”t knit but I am going to try weaving it on a my trianglurr weaving loom. I’ll let know how it urns out. Thank you for the pattern. I have two balls of subtle blue sock yarn that I was going to use for another shawl but I think this pattern will be a nice fit for the yarn I have. This pattern looks nice and straightforward — I’m really appreciative. I was just going to start my shawl and came across this pattern! Thanks a million!! !